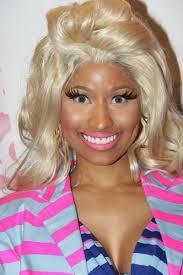 How come I never hear anyone complaining about how Nikki Minaj makes her skin look lighter? Is she just another Michael Jackson to everyone – an artistic oddity that people still love? But, it’s not entertainment if no one is talking about it. It’s just some f@$%ed up reality that people accept. What about nose changes for dogs? Would anyone say anything then?… I’m not saying I’m mad… Because I’m guilty of accepting strange things, too. I don’t think that anything that changes with too much frequency can last, however. Take the sun, for example. It’s been doing what it does for longer than anyone knows about. It suddenly deciding to take a vacation would mess everything up on the planet. Really, I’m just trying to figure out if Nikki Minaj’s color wars, nose changes, and teeth implants are somehow putting me off balance. Am I feeding myself love or am I feeding myself hate every time I look at the manifestation of her feelings about herself on her face?